Please Visit this Page for Pictures of the Best And Most Famous Ganpatis in Mumbai in 2016. The Khetwadi Gali 11 (Lane 11) Ganesh is called “Mumbaicha Maharaja”. 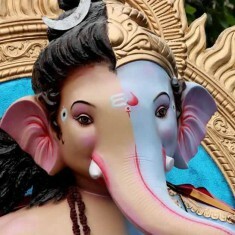 The 2014 “Mumbai Cha Maharaja” Ganesh idol is half in the form of Ganesh and half in the form of Ganesh’s father, Lord Shiva. 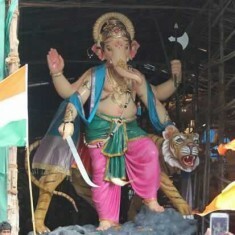 It is among the most creative Ganesha idols in Mumbai city. 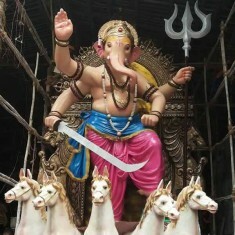 “Mumbai Cha Maharaja Sarvajanik GaneshOtsav Mandal” organizes the “Mumbai Cha Maharaja” Ganpati statue at Khetwadi 11 Lane. “Mumbaicha Maharaja” was founded in 1962. Its current President is Hemant Dixit. These are pictures of the 2013 Khetwadi Gali 11, Mumbaicha Maharaja and 2012 Khetwadi Lane 11, Mumbaicha Maharaja. GSB Seva Mandal’s Ganesh Murti is located at G.S.B. Sports Club Ground, Near S.N.D.T. Women’s College, King’s Circle, Matunga. “GSB Seva Mandal” is not just Mumbai’s richest Ganpati Mandal, it is also the richest Ganesh Mandal in the world. For the 2014 Ganesh Festival the Mandal has been insured for Rs 260 crore. In 2014 GSB Seva Mandal earned Rs 6.25 crore from donations and advertisements. This figure will rise once the valuation of donated jewellery is completed. Devotees donated Rs 63 Lakh in the 27 Donation Boxes (“Hundi”) at the GSB Seva Mandal’s Pandal. Videocon group was the chief sponsor of this Mandal. Last year the Mandal earned Rs 6.09 crore. The GSB Seva Mandal Ganesh Murti (Idol) is made of clay and is eco-friendly. GSB Seva Mandal’s Ganpati is made by Sculptors Avinash Patkar and Ashish Patkar of Patkar Arts (Girgaon). GSB Seva Mandal (King Circle) was founded in 1954 by Gowd Saraswat Brahmins from Karnataka. 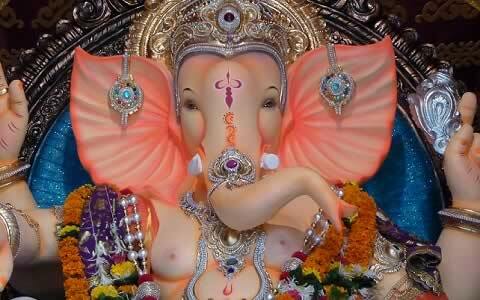 2014 is the 60th diamond jubilee celebration for this renowned Ganpati. 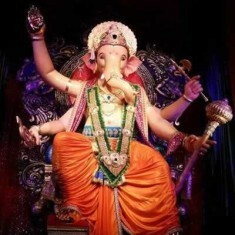 These are links to pictures of the 2013 GSB Seva Mandal (King Circle) Ganpati and 2012 GSB Seva Mandal Ganpati. “Lalbaugcha Raja” Ganpati is Mumbai most popular Ganesh Idol and most visited Ganesh Pandal. 2014 is the 81st year for Lalbagcha Raja (“King of Lalbaug”). Lalbaug Cha Raja Ganesh Idol, whose core design does not change, was first setup by Koli fisherwomen in 1934. Since 1935, the Kambli family has been making the Lalbaugcha Raja Ganpati. Design of Lalbagcha Raja has been patented. 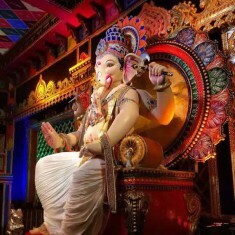 “Lalbaugcha Raja Sarvajanik Ganesh Mandal” organizes the Lalbaghcha Raja” Ganesh Idol and Ganeshotsav. Its current President is Ashok Maruti Pawar. For security, the organizers have installed 90 CCTV cameras, 80 metal detectors and 50 hand held detectors. 3,000 volunteers. will help during the Ganesh utsav. Lalbaghcha Raja Mandal has taken an insurance cover of Rs 50 crore. Daily around 15 Lac devotees visit Lalbaug Cha Raja. There are 2 lines in the Pandal – one for VIPs and the other for regular worshipers (“Navas” line). The Lalbaugcha Raja Mandal has provided an air-conditioned waiting tent for the comfort of visitors. In 2012, Lalbaugcha Raja Sarvajanik Ganesh Mandal had made 952 potholes, for which BMC fined them Rs 23,00,000. The Mandal refused to pay this fine. 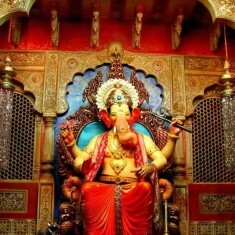 This is a link to Images of Lalbaugcha Raja from previous years. Lalbagh Ganesh Galli’s “Mumbaicha Raja” is among Mumbai’s oldest and most famous Ganesh Idols.2014 is the 87th year of this world famous Ganesh. 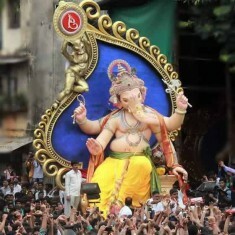 The 2014 Ganesh Galli Mumbaicha Raja is 22 feet tall and has a special 12 foot long gold necklace. 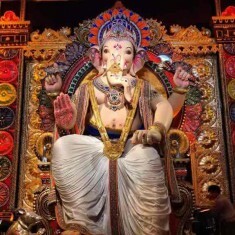 Lalbaug Ganesh Gali’s “Mumbaicha Raja” is well known for its beautiful Ganpati pandal and set decoration. The 2014 “Mumbai Cha Raja” pandal is a replica of the ancient temple of Jejuri near Pune. “Mumbaicha Raja” Ganpati is organized by Lalbaug Sarvajanik Utsav Mandal (Mumbaicha Raja), Ganesh Galli. Mumbaicha Raja Ganesh is only a couple of lanes away from Lalbaugcha Raja. 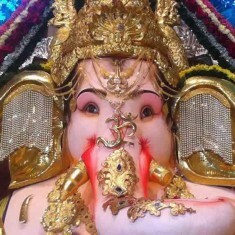 These are links to pictures of the 2013 Ganesh Galli, Mumbaicha Raja and 2012 Lalbaug Ganesh Gali, Mumbaicha Raja. In 2012 and 2013 “Khetwadicha Ganraj” of Khetwadi Gali 12 was awarded the BEST GANESH IDOL in Mumbai. 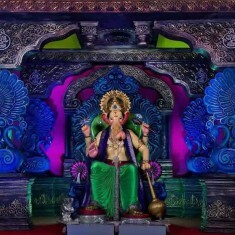 The “Khetwadi Cha Ganraj” Mandal, “12th Khetwadi Sarvajanik Ganeshotsav Mandal”, is one of Mumbai’s best Ganesh Mandal. The 2014 Khetwadi Galli 12 Ganpati Pandal (Mandap) is beautifully decorated. 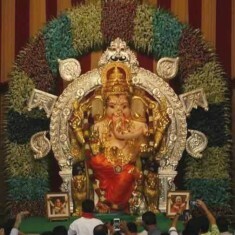 The 2000 “Khetwadicha Ganraj” holds the record for the tallest Ganpati idol in Mumbai. These are links to the 2013 Khetwadi Lane 12, Khetwadicha Ganraj and 2012 Khetwadicha Ganraj. 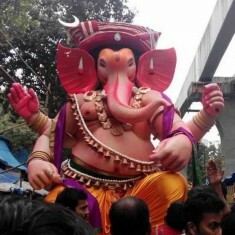 The 2014 “Chinchpokli Cha Chintamani” Ganpati idol is among Mumbai’s best Ganesh Murtis. 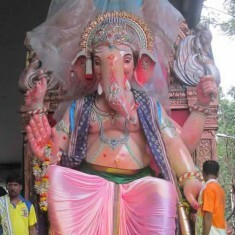 “Chinchpokli Sarvajanik Utsav Mandal” is the Ganeshotsav Mandal that manages the “Chinchpoklicha Chintamani” Ganesh Idol. This Ganesh Mandal was founded in 1920 and is among Mumbai’s oldest Ganpati Mandals. The beautiful calligrapher on the throne “Chinchpokli Cha Chintamani” is by Achyut Palav. These are links to pictures of the 2013 Chinchpokli Cha Chintamani and 2012 Chinchpokli Cha Chintamani. The tall Parelcha Raja (Nare Park) Ganesh is standing on the 5-headed “Sheshnag”. 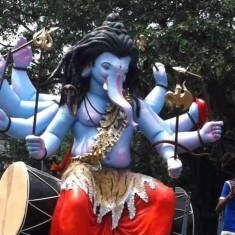 The 2014 Nare Park “Parel Cha Raja” has a statue of Brahma attached to his naval. 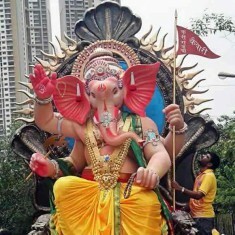 The 2014 Nare Park (Parel) Parelcha Raja Ganpati statue was made by Rajan R Khatu. “Parelcha Raja” Gameshutsav is organized by Parel Vibhag Sarvajanik Geneshutsav Mandal, Nare Park. This mandal was formed in 1947 is among the oldest Ganesh Mandals in its area. 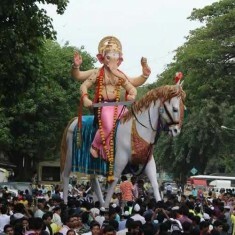 These links have Pictures of the Amazing 2013 Parelcha Raja Nare Park and 2012 Parelcha Raja Nare Park Ganpati. 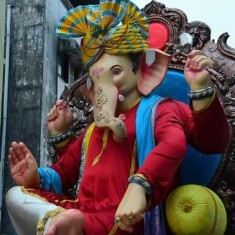 The “Kamatipura Cha Chintamani” is one of the best Ganesh Idols in Mumbai in 2014. 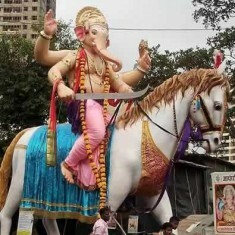 This tall Ganpati idol is seated on a horse. 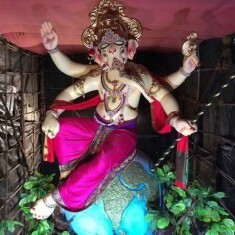 The “Kamatipuracha Chintamani” Ganesh Idol was designed and made by Vijay Khatu, one of Mumbai’s best known Ganpati Idol makers. 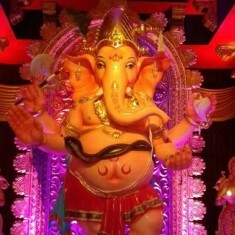 “Kamathipura Sarvajanik Ganeshutsav Mandal” is the Ganpatiutsav Mandal that organized the “Kamatipura Cha Chintamani” Ganesh Murti. The Ganesh Pandal is located at Mumbai’s Kamathipura 14 Lane (West). 2014 is the 75th year of “Tulsiwadicha Maharaja” Ganesh Murti. Established in 1939, this year is the Platinum Jubilee Year for “Tulsiwadi Cha Maharaja”. “Tulsiwadicha Maharaja” is not just among Mumbai’s older Ganpati idols, it is also consistently among its best in terms of creativity. The 2014 Ganesh Murti is astride five white horses. The Tardeo Tulsiwadi Ganesh Pandal is modelled on the TV serial “Jai Malhar”, which is based on Khandoba, an avatar of Lord Shiva. 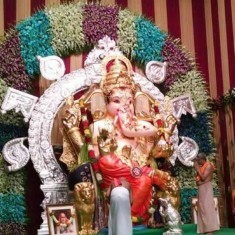 The 2013 “Tulsiwadi Cha Maharaja” Idol had 300,000 artificial diamonds and was voted the third best Ganesh Idol in Mumbai. “Tulsiwadicha Maharaja” is managed by “Tulsiwadi Sarvajanik Ganeshotsav Mandal”. 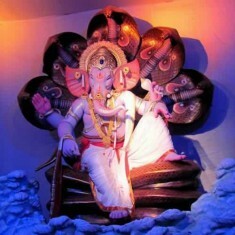 The Ganesh statue is located at Tulsiwadi, Tardeo. This link has pictures of the 2013 Tardeo Tulsiwadi Cha Maharaja Ganpati. 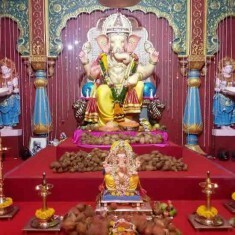 The “Fort Cha Raja” Ganpati Idol is organized by Shree Balgopal Sarvajanik Ganeshotsav Mandal (Fort). 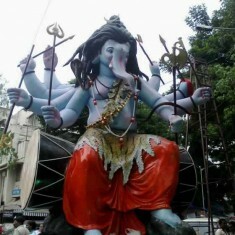 “Fortcha Raja” Ganesh statue is located near the GPO. “DongriCha Raja” Ganesh Idol is organized by “Chinch Bunder Dongri Sarvajanik Ganeshutsav Mandal” (Chinch Bunder). 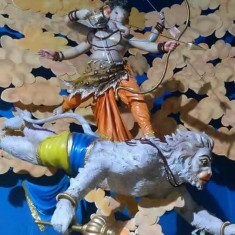 “Dongri Cha Raja“ Ganpati Murti is made by Sculptor Manohar Bagwe of Bagwe Arts. 2014 is the 76th years for the “DongriCha Raja” Mandal. It was started in 1939. Vile Parle Vishwacha Raja Ganesh Looks Like Lord Shiva. “Vishwacha Raja” (Vile Parle East) Ganpati Idol looks like Lord Shiv. Previous “Vishwacha Raja” Ganesh Murtis (Statues) too have been in the form of Lord Shiva. Vile Parle Vishwa Cha Raja is organized by “Bal Mitra Mandal Vile Parle”. “Vishwacha Raja” Ganpati is located at Sadananda Road, Vile Parle East, Mumbai. 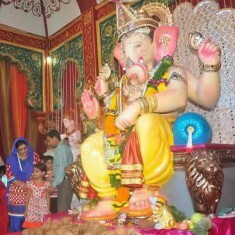 The Chandanwadi Chira Bazaar Ganapati Idol is organized by Akhil Chandanwadi Sarvajanik Ganeshustav Mandal. The Chira Bazar (Chandanwadi) Ganesh Murti is a stunning looking Idol standing next to a tiger. 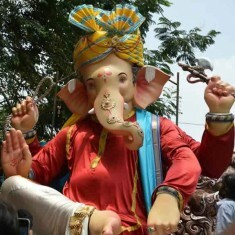 The 2012 Vijay Khatu designed Chandanwadi Ganesh statue was awarded the 2nd Runner-up Best Ganpati Idol in Mumbai. Please visit this page for pictures of the 2013 Chira Bazaar (Chandanwadi) Ganesh. 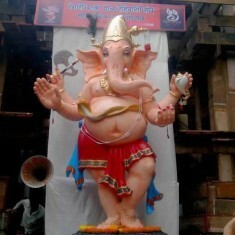 The 2014 “Ladka Lambodar“Rangari Badak Chawl Ganesh statue is made by sculptor Ram Sarang, of Sarang Bhandu Artworks. The first Ladka Lambodar Ganesh idol at Rangari Badak Chawl was installed in 1938. This is the 75th year (Platinum Jubilee) of the Rangari Badak Ganpati. “Rangari Badak Chawl Ganpati Mandal”, Kalachowki, is the Mandal that organizes the Rangari Badak Chawl Ganeshotsav. Traditionally the Mandal has emphasized on “Sant Parampara”, which teaches equality for all caste and religion. The 2014 Rangari Badak Chawl Ganesh Mandap (Pandal) is among the best in Mumbai. It is 100 feet long and the “Ladka Lambodar” idol is surrounded by female devotees. Rangari Badak consists of 16 chawls. Chawl number 1 to 10 are the Badak chawl. “Vasaicha Maharaja” Ganpati is also known as “Navsala Pavnara Vasaicha Maharaja”. 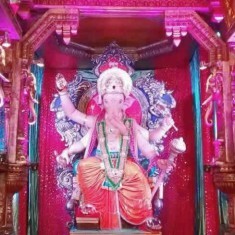 The “Vasai Cha Maharaja“ Ganesh Pandal is at Chhatrapati Shivaji Maharaj Chowk, Anand Nagar, Vasai. “Vasai Cha Maharaja“ Ganpati Visarjan is done after 7 days. 2014 “Vasaicha Maharaja” Ganesha statue is made by famous Ganpati Idol Sculptor, Vijay Khatu. “Anand Nagar Sarvajanik Geneshutsav Mandal” are the organizers of “Vasaicha Maharaja“ Ganesh Festival. 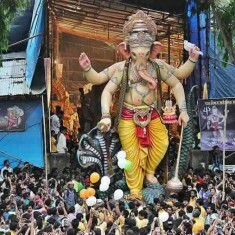 The 27 feet tall Khambata Lane “Khetwadicha Raja” is among Mumbai’s tallest Ganesh Murtis in 2014. 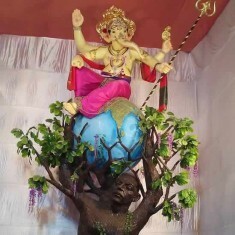 The Khetwadicha Raja (Khambata Lane) Ganesha is perched on a model of earth, which in turn is held up by a tree. “Khetwadicha Raja” is managed by “Khambata Road Sarvajanik Ganeshotsav Mandal”, which started in 1970. People of all communities and religions visit this Ganesh Pandal. Khetwadi Khambata Road Ganpati’s are usually unique. This is a link to pictures of the 2013 Khetwadicha Raja (Khambata Lane). The 2014 Khetwadi 10th Lane Ganesh (“Bappa Khetwadicha”) has a beautiful Pandal (Ganpati Set). 2014 Khetwadi Gali 10 Ganpati Idol is made by Bagwe Arts. Khetwadi Lane 10 Ganesh is managed by “Om Tandav Sarvajanik Ganeshotsav Mandal”. 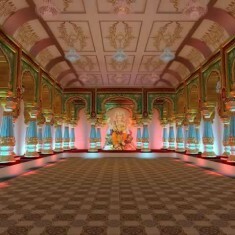 The Ganesh Mandap/Pandal of the 2014 “Andhericha Raja” is a replica of the Mysore Palace (Amba Vilas Palace). 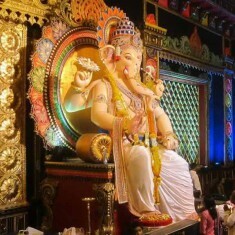 It is among the best Ganpati Pandals in Mumbai. The amazing sets are made by art directors Raju Savla and Dharmesh Shah. Unlike most large Ganesh Idols, whose Visarjan (Immersion) takes place on “Anant Chaturdashi”, Andhericha Raja’s Visarjan takes place one day later on “Sankashti”. The legend behind this that the chairman of the “Andheri Cha Raja“ Mandal had his wishes fulfilled in 1975. 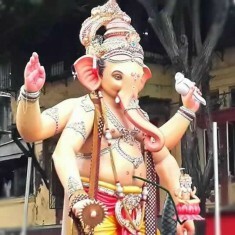 Since then “Andhericha Raja” is also known as “Navasala Pavnara Ganpati” (wish fulfilling Ganesh) and its Visarjan is done on “Sankashti Chaturthi”. The Visarjan for the smaller “Andheri Cha Raja“ Puja Ganesh Idol is done on “Anant Chaturthi” (Anant Chaturdashi”). 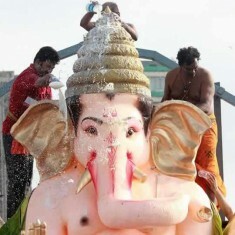 The design of the 8.5 feet “Andhericha Raja” has remained unchanged in 49 years. 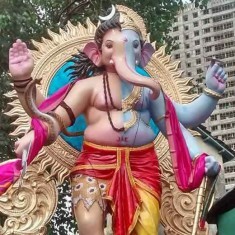 “Azad Nagar Sarvajanik Utsav Samiti”, the Mandal that manages Andhericha Raja, has applied for copyright of the “Andhericha Raja” Ganpati Idol. “Andhericha Raja” was started in 1966. Andheri Telli Galli Ganapati tends to be unique. The 2014 “Andheri Telli Gali Cha Samrat” is a Ganesh riding on the back of a flying Hanuman. “Lokmanya Sarvajanik Ganesh Utsav Mandal” organizes the Andheri Telli Gully Ganesh, which is located in Anheri East. 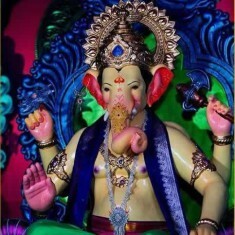 This link has pictures of past Andheri Teli Gali Ganesh Idols. “Raja Tejukayacha” is one of the three most well known Ganpatis from Lalbaug. The other two are “Ganesh Galli Mumbaicha Raja” and “Lalbaugcha Raja”. 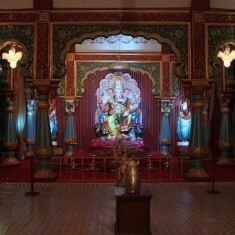 The first “Raja Tejukaya Cha” Ganpati Murti was installed in 1980. Tejukaya Sarvajanik Ganesh Ustov Mandal Trust manages Tejukayacha Raja. The name “Tejukaya” comes from British era civil constructor “Rao Bahadur Seth Shri Tejukaya J. P.”. Raja Tejukayacha Ganesh sculpture is made by famous Ganpati creator Rajan Zhad. 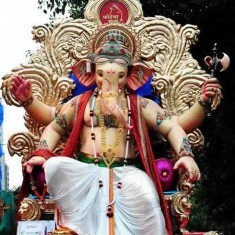 Vile Parlecha Samrat is among Mumbai’s best Ganpati Murti (Idol) in 2014. 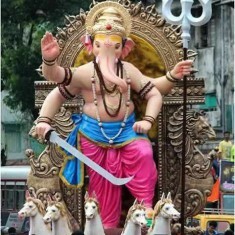 The 18 feet, royal, “Vileparle Cha Samrat” Ganesh statue is made by renowned Ganpati sculptor, Rajan Zhad. 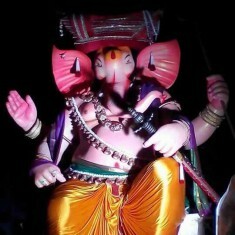 The “Raja Tejukayacha” Ganpati Idol too is made by Rajan Zad. 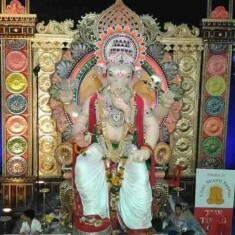 Ville Parle Cha Samrat Ganesh is at Shivaji Nagar, opposite Bhuta High school, Shahaji Raje Marg, Vile Parle (East). Currey Road Kaivari is a popular Mumbai Ganesh Idol. The 2014 “Currey Roadcha Kaivari” is a majestic looking Ganpati statue that is seated on a throne of snakes and lions. On top of the Kaivari’s throne is “Sheshnag”, the five headed snake. 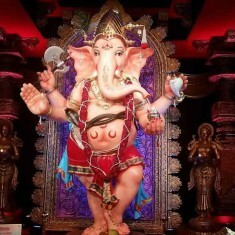 “Balgopal Sarvajanik Ganeshotsav Mandal” organizes “Currey Roadcha Kaivari” Ganpati. 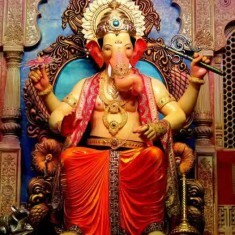 Every year the “Times Of India” group gives awards to the Best Ganpati Idols in Mumbai, Best Ganesh Mandals in Mumbai and Most Visited Ganesh in Mumbai. Winners of these Best Ganesh Awards are listed below. 1st PRIZE: BEST GANESH IDOL IN MUMBAI GSB Seva Mandal, King’s Circle Khetwadicha Ganraj (Khetwadi 12th Lane) Khetwadi 12th Lane, Girgaum. Idol designed by Raju Shinde. 2nd PRIZE: BEST GANESH MANDAL IN MUMBAI Mumbai Ganesh Mahotsav by Lodha Foundation, Grant Road Fort Vibhag SGM (Fort Icchapurti) – Mysore Palace Mumbai Ganesh Mahotsav by Lodha Foundation, Grant Road. Art director Nitin Desai. 3rd PRIZE: BEST GANESH MANDAL IN MUMBAI Shiv Chhaya Mitra Mandal, Turbhe Sarvajanik Ganeshotsav Mandal ( Vashi Sector 17) Khetwadi 12th Lane, Girgaum. Mandal based on ISKCON temple. Art director Dilip Dada. The main Ganpati Visarjan (Ganesh Idol Immersion) places in Mumbai are listed below. 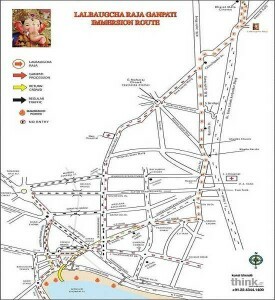 Please click on the link to Ganesh Visarjan to see the detailed road route, map and traffic flow for Ganpati Immersion in Mumbai. 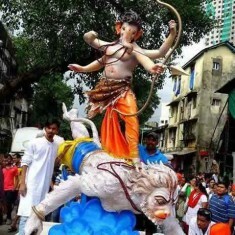 For the 2014 Ganesh Visarjan on 30 August, 2 September, 4 September and 8 September, Mumbai Traffic Police has closed 49 roads and 55 routes have been made one-way. These traffic restrictions are enforced from noon to 6:00 am on the next day. 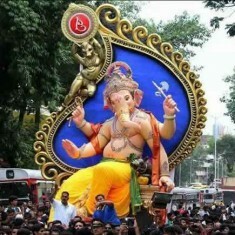 Mumbai’s BMC has identified around 115 Ganpati Visarjan places in and around Mumbai for the Ganesh Festival. Please visit this page for 2014 Pictures of Ganesh Visarjan in Mumbai. It is believed that Lord Ganesh was born at noon (“Madhyahana Kaal”). Hence, Ganpati Pooja or Ganesh Aarti is usually performed around noon. 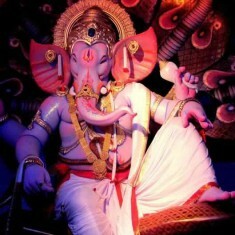 11:25 am to 1:30 pm is considered a good time to perform Ganesh Pooja. As per estimates, 200,000 Ganesh idols are worshipped in Mumbai during Ganesh Utsav. Of these, 95% are set up in private homes, whereas the rest are installed in “Pandals” which attract large number of devotees. 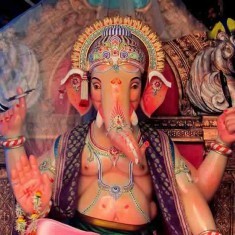 Mumbai is famous for large community based Ganesh Festival celebration, known as “Sarvajanik Ganeshotsav”. 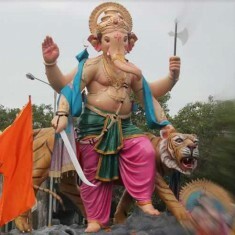 This form of community celebration, where Mandals (social groups) set up large Ganesh Idols, was first introduced in 1893 by freedom fighter Lokmanya Tilak. Tilak introduced large Ganapati street celebration to unite Indians and to protest against British rule. He used Ganesh Chaturthi and Ganeshutsav as an opportunity to spread the message of independence (“Swaraj“). 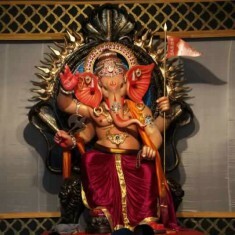 Mumbai has around 10,500 registered Sarvajanik Ganesh Mandals. “Brihanmumbai Sarvajanik Ganeshotsav Samanvay Samiti” is organization that coordinates among Mumbai’s Ganpati Mandals. Its current President is Naresh Dahibavkar. 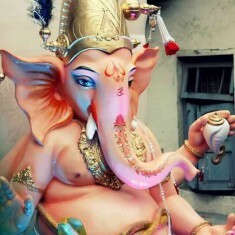 Many of Mumbai Ganpati idols are made of Plaster Of Paris (POP) and painted with synthetic paints. Unfortunately, when POP is immersed in water, it is not good for the environment. In recent years, there is a trend to using environment sound material such as natural clay. Start date of Ganesh Utsav (Ganesh Chaturthi festival) is 29 August, 2014 and end date of Ganesh Chaturti festival is 8 September, 2014. 8 September, 2014 (after 10 days) Many households perform Ganpati Visarjan after 1 day. Most large Mumbai Ganesh Mandals immerse their Ganapati idols after 10 days (8 Sept, 2014). The 5th day immersion (3 Sept, 2014) is “Gauri Visarjan”. Some families and Mandals immerse their Ganesh idols after 11 days (9 Sept, 2014). “Sankashti” is on 12 Sept, 2014. 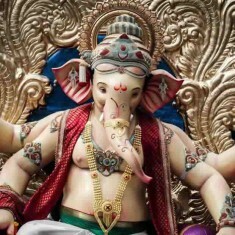 PLEASE NOTE: In Maharashtra, in addition to Ganesh Chaturti (Vinayaka Chaturthi), the birth of Lord Ganesh is also celebrated on “Ganesh Jayanti”; which as per the Hindu calendar is on shukla paksha chaturthi (4th day of the waxing moon), in the month of “Magha”. “Ganesh Jayanti” is usually celebrated in February.